The class-A industrial buildings, with a total of 391,937 square feet, were sold by “a major pension fund” represented by Montreal-based Triovest, says Speirs, executive vice-president, capital markets at JLL in Montreal. The buildings at 4075, 4101-4117, 4133-4137, 4177-4201 Industrial Boulevard and 5555 William-Price Street were built between 2002 and 2006 and have ceiling heights ranging from 24 to 34 feet. While GWL Realty Advisors is listed as the purchaser, it acts as an advisor on behalf of investors. The Laval acquisition was made on behalf of the Great-West Life Canadian Real Estate Investment Fund No.1. 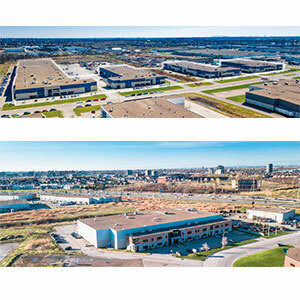 Located in the Laval Centre Park, the industrial portfolio is in one of the largest municipal industrial parks in the province with 14 million square feet of inventory. It is adjacent to Highways 15 and 440 and is just north of Montreal. JLL says the buildings are 100 per cent occupied by tenants which include Mecaer Aviation, Quo Vadis, John Brooks, Iron Mountain and Bissett. A JLL marketing brochure notes average weighted net rents are 12 per cent under market, presenting the incoming owners with “significant upside potential.” There is an additional 60,000 square feet of additional development land possible at 4133-4137 Industrial. “Vacancy rates in the Greater Montreal Area are nearing historic lows, with vacancy rates for more than 24-foot clear heights at about one per cent and a significant shortage of new supply on the horizon,” the brochure notes. Speirs says the Montreal industrial market is very robust. “One of the major changes we are seeing in the market is that investors are now targeting assets with shorter-term leases in order to capture rental growth potential,” he says. While GWL Realty Advisors has bought five industrial buildings in Laval, it has also sold two class-A office buildings with 188,375 square feet in the Montreal borough of Saint-Laurent. The buildings at 6505 Trans-Canada Highway and 555 Dr. Frédérik-Phillips Boulevard were bought by Montreal-based Olymbec and Pava Corp. for $18.8 million. Speirs says the selling price was higher than the price guidance. “We had a good level of interest on the properties, driven primarily by local private investors,” he says. Built in 1987, 6505 Trans-Canada Highway has six storeys and 108,020 square feet of gross leasable area and is certified BOMA Best Gold. Four-storey 555 Dr. Frédérik-Phillips Boulevard was built in 1989, has 80,355 square feet of gross leasable area and has BOMA Best Silver certification. Although the buildings have been well-managed and maintained, occupancy is below 50 per cent, which translates to “very high” vacancy, Speirs notes. Major tenants include Ford Canada, Apple, Broadsoft and Puma who represent more than 25 per cent of gross leasable area. “Suburban office is a difficult asset class,” Speirs says. The situation in Montreal has been compounded by previously offered municipal tax subsidies which added supply without real demand. However, “the market has now turned a corner. The subsidies have ceased and the leasing market is gaining momentum, reflecting the strength of Montreal’s economy,” Speirs says. According to JLL’s second-quarter 2018 Office Insight for Montreal, three large sublet availabilities were added to the market in Saint-Laurent’s Technoparc, which pushed up the overall office vacancy rate in Saint-Laurent to 22.4 per cent, a 140 basis point increase from the previous quarter. However, these spaces are not expected to remain vacant for long given that the Technoparc is already sought-after by high-tech companies. The site will also soon have its own REM light rail network station linked to downtown Montreal. According to a JLL marketing brochure, the Saint-Laurent office buildings represent “a rare value-added opportunity, with the potential to significantly increase the portfolio’s income through active asset management, including leasing and renewal. Located on the highway, the buildings are “ideal for corporate signage and benefits from exceptional visibility to over 110,000 vehicles daily,” the brochure says.